584 pages | 177 Color Illus. Since the publication of the first edition, the statistical landscape has substantially changed for analyzing space and space-time data. More than twice the size of its predecessor, Hierarchical Modeling and Analysis for Spatial Data, Second Edition reflects the major growth in spatial statistics as both a research area and an area of application. This second edition continues to provide a complete treatment of the theory, methods, and application of hierarchical modelingfor spatial and spatiotemporal data. It tackles current challenges in handling this type of data, with increased emphasis on observational data, big data, and the upsurge of associated software tools. The authors also explore important application domains, including environmental science, forestry, public health, and real estate. "The second edition of Hierarchical Modeling and Analysis for Spatial Data is a nice, rich, and excellent book, which deserves to be read by students and researchers, especially those working in the area of geosciences, environmental sciences, public health, ecology, and epidemiology. This second edition builds on the strengths of the first edition and includes significant new chapters that make the book rather comprehensive. … About 20 different applications are presented along the text (some of them are treated in several chapters). They nicely illustrate the use of the methods that are exposed in the book. These applications are based on data in ecology (…), epidemiology and public health (…), environmental sciences (…), and economics … To conclude, the second edition of Hierarchical Modeling and Analysis for Spatial Data provides an excellent treatment of methods and applications in spatial statistics. It takes into consideration 10 years of changes (with respect to the first edition), including the changes induced by the increasing complexity and volume of data and the increasing complexity of questions that one aims to address with modeling and inference approaches. In Chapter 1, the authors claim that they aimed "to present a practical, self-contained treatment of hierarchical modeling, and data analysis for complex spatial (and spatiotemporal) datasets". They succeeded." "If you want a thorough taste of the spatial statistics field, Hierarchical Modeling and Analysis for Spatial Data is definitely a book for you. It is accessible and comprehensive, and it fully explores how useful spatial statistics can be without sacrificing the theory it is grounded in. This is a great book for graduate students and professors who want to understand the theoretical underpinnings of the field as well as practitioners who want a toolkit for tackling spatial problems. … the authors provide an easy-to-use online resource with all of the book’s code and datasets. Indeed, these examples are so comprehensive that readers could learn a lot by simply going through them. The accessible theoretical material paired with these detailed examples make Hierarchical Modeling and Analysis for Spatial Data an especially substantial and worthwhile investment. … the authors do not hold back on their references. … Some could view this book as a spatial statistics biography from the 1950s onward … If a graduate student or professor wants a full taste of the spatial statistics literature—where it has been, where it is, and where it still needs to go—this is probably one of the best books they could pick up. … We find this book to give a much more applied perspective with better computational tools, and thus believe it to be more accessible to a wider audience [than Cressie]. We recommend this book to anyone who seriously wants to start being involved in spatial statistics." "This is a very welcome second edition of a nice and very successful book written by three experts in the field … I have no doubts that this updated text will continue being a compulsory reference for those graduate students and researchers interested in understanding and applying any of the three areas of spatial statistics … printed in color and this helps to see better some of the graphical representations … excellent book that I highly recommend for anyone interested in the fascinating field of space and space–time modeling. This is definitely one of those second edition books that is worthwhile having. Many thanks to the authors for their effort." "This book was a pleasure to review. Most of the emphasis is on insight and intuition with relatively little on traditional multivariate techniques. I also found some of the explanations delightful … while they did not convert me to Bayesianism, [the authors] made me reconsider some of my assumptions. They later state 'Our book is intended as a research monograph, presenting the state of the art' and my impression is that they have succeeded … In many sections the formulae are augmented by showing R or S code, making it easy to actually apply the mathematics. In summary, this is a nice book." "The book contains a wealth of material not available elsewhere in a unified manner. Each chapter contains worked out examples using some well-known software packages and has exercises with related computer code and data on a supporting web page. 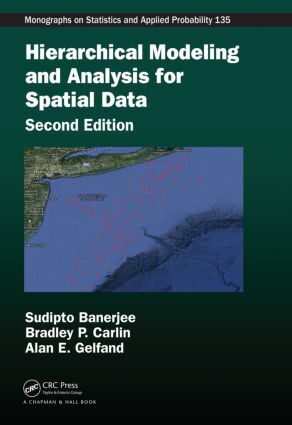 The book is up to date in its coverage … an important addition to the literature on spatial data analysis."